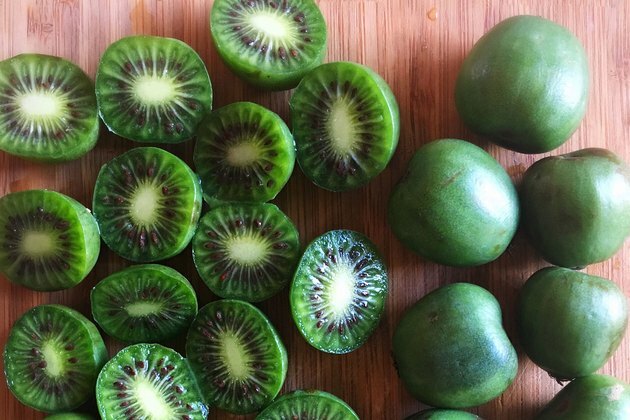 What Are Kiwi Berries and Why Are They So Adorable? Move over, pink pineapples! A fantastic new fruit is invading Instagram. It’s tiny, it’s green and it’s a superfood. Say hello to the kiwi berry. Kiwi berries look like a miniature kiwifruit minus the fuzz. The size of a large grape, kiwi berries have health benefits similar to their full-size counterparts — high in fiber and packed full of vitamin C as well as vitamins A, E and B. Also, they are downright adorable! Here’s where they majorly differ from regular kiwis: the taste. The flavor is more complex, sweet and acidic, according to Delish. While many people simply pop them in their mouths and savor their deliciousness, one Instagram user revealed she likes to “roast them with coconut nectar and eat them over coconut milk ice cream.” Another adds them to her breakfast cereal. You can even add them to a cocktail. Unlike pink pineapples, which were basically the product of a science project for DelMonte and Dole, kiwi berries have been around forever. While some claim they are thousands of years old, they were first documented as early as 1843 and have been harvested in the United States since the early 1900s. They have yet to achieve commercial success due mainly to the fact that they have a short season (mostly September to early October) and don’t last long after being plucked from the tree. In addition, according to one European distributor, they only grow on trees that have been around at least three years. The berries develop from white flowers over a period of three to five months, at which point they are picked by hand. Complicated, right? However, we may be seeing more kiwi berries in the future, thanks to science. According to European distributor Nergi, in the 1990s some New Zealand botanists started interbreeding different varieties of the kiwi berry and created new breeds that were just as delicious and had a longer shelf life. Native to colder climates, they are grown in Japan, Korea, Siberia and Northern China, and stateside in Oregon, Pennsylvania, New Jersey, Washington and Maryland. Dying to try a kiwi berry right this second? Unfortunately, Melissa’s produce only offers them February to March and September to November. Though other purveyors — including your local farmers market — may have a slightly different timeline, it’s likely you’ll have to settle for a regular kiwi. But at least now you know to be first in line! Have you tried kiwi berries? How would you describe the taste? What other unique fruits do you like? Pink Pineapples May Be the New Unicorn Food, But What Are They?! When Are Blackberries in Season? What Fruits Are Not Citrus? Can You Eat the Skin of a Kiwi Fruit?